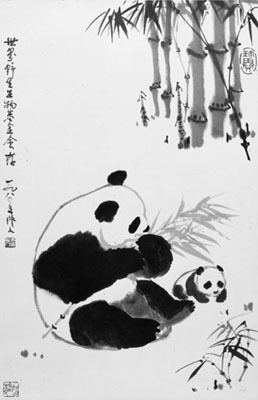 1985-1988 Ministry of Forestry (now the State Forestry Administration) worked with WWF to conduct the second survey of giant panda’s population and living conditions around the country. The survey results were released in 1988, showing that the population of wild giant panda was just 1114 in China. 1997 Experts reconvene in Wolong Nature Reserve to discuss the feasibility of reintroducing pandas into the wild, concluding that "the release of the giant panda is not recommended at this time. … The most important activities to promote panda conservation are habitat conservation and research into wild panda populations and habitats"
1998 Sichuan Forestry Department, with the support from WWF, initiated the biodiversity monitoring in 11 panda reserves in the Minshan mountain range. 1999 – 2003 Ministry of Forestry and WWF jointly carried out the Third National Survey on Giant Panda in China. Compared with the previous two surveys, the third survey collected more complete and detailed data of the giant panda’s range, which was an important reference for giant panda conservation work in the following ten years. Early 2002 An agreement is signed between WWF and the Shaanxi Forestry Department to establish 13 new reserves and create the first habitat corridors in the Qinling mountains. The project aims to reconnect the fragmented giant panda populations in this mountain range. 2002 WWF began the Forest Landscape-based Conservation Project in the Minshan Mountains, based on the lessons from the Pingwu Integrated Conservation and Development Project (ICDP) and mainly working on giant panda habitat and regional ecosystem protection. 2002 With the support of WWF, the Conservation Newsletter of Giant Panda Reserves in Sichuan Province was created and has became an effective platform for information exchange among giant panda reserves in the province. 2002 The Chinese government announces a new Wildlife and Protected Areas Programme that will invest £10 million over the next 10 years in 15 flagship species, including the giant panda. Eighteen new panda reserves will be created under this programme. April 2003 Facilitated by WWF’s Qinling Project, the Shaanxi Provincial Government officially sanctioned five new panda reserves and five ecological corridors for the giant panda, increasing protected area for the giant pandas in Qinling by over 150,000 ha. WWF recognized this exciting initative as a major "Gift to the Earth.". 2003 Regular biodiversity monitoring work has been carried out in all the 17 giant panda reserves in the Minshan mountain range. June 2004 The result of the Third National Survey on the Giant Panda and its habitat released by the State Council of China, showing there were 1596 giant pandas in the wild. 2006 Mount Minshan was listed as the 103th Gift to Earth. Minshan Mountains cross Sichuan and Gansu Provinces, and both provincial governments promised to collaborate in further in enhancing the management and protection of giant panda habitat. 2007 WWF launched the Green Heart of China Project, which expanded the integrated conservation and development project in the Qinling Mountains and Mount Minshan to the entire giant panda range. Then WWF began landscape-based protection work in six mountain areas, which resembled a beating heart on the map of China. 2010 – 2014 The State Forestry Administration conducted the Fourth National Giant Panda Survey. WWF participated in the preparation work for the survey in Sichuan, Shaanxi and Gansu Province, as well as supporting the development of the survey plan and periodical evaluations. 2015 The State Forestry Administration released the results of the Fourth National Giant Panda Survey, showing that the population of wild giant pandas had increased by 268 to 1864 over the last decade. 2015 The 2015-2025 Giant Panda Protection Strategy was announced. It targets the giant panda as a flagship species and involves comprehensive and landscaped-based protection for giant panda habitats. Giant panda Ailuropoda melanoleuca Panda mother and cub, eating bamboo. Painting by Wu Tso-Jen, Chairman of the Association of Painters in China and Head of China's Academy of Art. 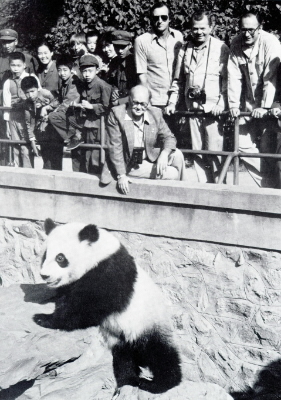 Sir Peter Scott visiting a Giant Panda in the Beijing zoo.